If, as rumour has it, the National Arts Festival is a little quieter than is usual this year - then someone forgot to tell the folk at the Jazz Hub, housed at the DSG School in Grahamstown. The place is abuzz with excitement and the vibe is electric as jazz lovers are filling the venues to capacity and beyond to experience some of the greatest jazz performances ever seen at the festival. I had booked to see a collaboration between two of the leading young pianists in the jazz world today. 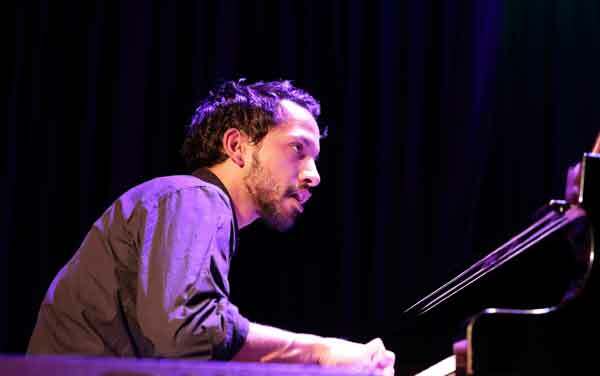 South African Kyle Shepherd was to team up with French Israeli jazz pianist, Yaron Herman. They were to explore and celebrate the cultural and stylistic differences between their musical styles. Unfortunately, Herman for an unexplained reason, did not travel to our country and so, as a replacement, the audience were given a fabulous performance by the brilliant Kyle Shepherd Trio. The Cape Town based Kyle Shepherd Trio is one of South Africa’s most progressive Jazz Trios, and is fast gaining International recognition. Shepherd himself is regarded one of the leading progressive pianists and composers of his generation. The 28 year-old virtuoso musician has already released five critically acclaimed albums and has toured extensively overseas. Playing double-bass in the Trio is Shane Cooper. Cooper is also a composer and producer who collaborates regularly with many of South Africa’s leading jazz and contemporary musicians. Drummer, Jonno Sweetman, is one of the most original sounding drummers on the music scene in South Africa. He is always exploring innovative ways of creating fresh and new sounds on his drum kit. Both Shepherd and Cooper are previous recipients of the Standard Bank Young Artist Award at the National Arts Festival. The trio has been together for the past nine years and they displayed wonderful synergy and energy as they performed an hour-long set. No fuss or chatter, just mesmerising and breathtaking wall to wall music played by three very gifted musicians. They used interesting methods to create different sound at times. Shepherd placed a few sheets of paper on the piano stings while Cooper used drum sticks on his double-bass and Sweetman used what looked like rolled-up magazines to play the drums. It may all seem a bit weird, but in context it gave a different and new dimension to their music. One of the highlights of the concert was Shane Cooper’s solo break on the double-bass. This man is really very good and he gave a new meaning to the term "flying fingers". This performance alone was worth the price of the ticket.